We all understand that one of the main reasons for investigating accidents is to find out why it happened, in order to prevent it happening again. The impact of an accident can be very damaging to staff morale, disruption of operations and the company reputation with significant associated costs. Learning from failures and implementing changes is an important step for organisations to move forward positively on every level. When learning these lessons from accidents, however, it is important that we don’t only focus on the physical causes of the accident (also referred to as the direct causes) but also to the causes in the management system (i.e. the root causes, i.e. a lack of management or systems control). The Domino Theory of Accident Causation as seen below can demonstrate this. 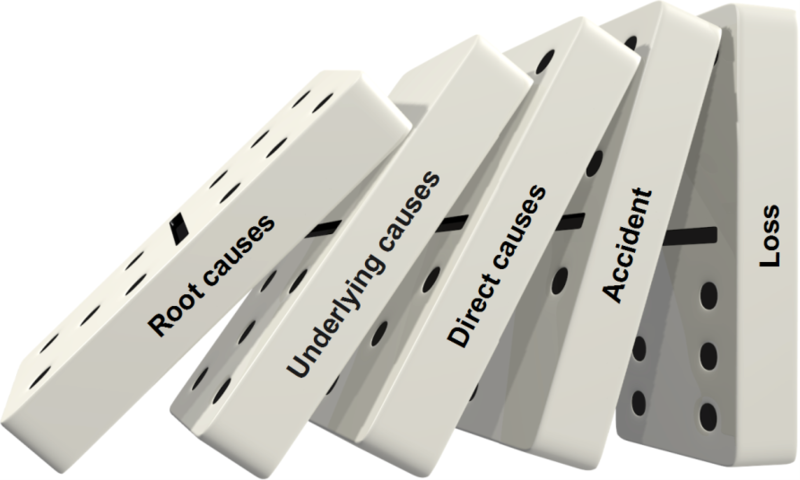 The domino theory suggests that accidents are caused by a series of failings; if future incidents are to be prevented, an organisation must not only address the direct/immediate causes but also the root causes in the Domino Theory image. The root causes, however, are often associated with lack of, or failing policies, culture, leadership, commitment and as such are much more challenging to address. Many may require a fundamental change in the philosophy and operation of the organisation and can, therefore, be very challenging and time-consuming to implement. It is vital however that these necessary changes are identified and implemented if the organisation is to learn from its past accidents and prevent them and similar incidents happening again in the future. The following fatal accident scenario clearly demonstrates an example of where changes were not identified and implemented at the direct cause level nor at the root cause either. In the mid-1990s, a small materials handling machine at a particular site of a large waste recycling company developed a fault. The fault was suspected to have been associated with the hydraulics of the main rams used to lift the boom to which an electromagnet was attached (see the example in the picture). The Mechanical Fitter was asked by the Production Manager to investigate the fault and suggest any repairs that may be required. The Fitter was working on the machine on his own (others were on-site but working elsewhere) when the magnet fell, fatally crushing him. A major investigation swiftly commenced on-site involving site management, senior management from the organisation’s head office, the police and the HSE. Why and how did the magnet fall? How was the Fitter trapped underneath? The machine had passed its most recent statutory examination (current legislation is the Lifting Operations and Lifting Equipment Regulations 1998, LOLER) and the Fitter had been trained to drive it. Also, the chains attaching the magnet to the lifting boom were still in place and were in good working order. The whole lifting boom with the magnet attached must, therefore, have fallen as one. A realisation also emerged that the magnet must have been in the air and dropped to the ground too quickly for the Fitter to take evasive action. He must have been stood under the magnet when it fell. However, what could have caused it to fall so quickly and why was he stood in that position? The investigation led to the following assumptions to be made on the sequence of events resulting in the fatal accident. Based on the position of the magnet in relation to the machine body, it was decided that the Fitter had probably raised the magnet to see if any leaks of hydraulic oil could be seen on the lifting ram’s pipework while it was under pressure. He had probably spotted a leak and had stood under the magnet to investigate it more closely when the magnet fell. It was also noted that in accordance with training and on-site observations of other drivers and machines, magnets are always brought to rest on the ground when the machines are not being used. So why had the magnet fallen so suddenly? There must have been a sudden loss of hydraulic pressure due to something failing or being removed. Either the pipework had catastrophically failed due to the leak, or the Fitter had tried to adjust the pipework before lowering the magnet to the ground. The answer to the magnet question, however, could never be established as no one saw the accident happening. The only line of investigation left was to establish if a loss of hydraulic pressure in the lifting boom ram could cause the magnet to free fall to the ground or if the design of the hydraulic system could have prevented this. The most common way of preventing a free fall by a loss of system pressure was by the use of a check valve or non-return valve (a check valve, normally allows fluid to flow through it in only one direction). So the non-return valve in the hydraulic circuit would keep the hydraulic fluid in the ram if the feed pressure was lost, thus keeping the boom and magnet in the air. By retrieving circuit diagrams of the machine’s hydraulic system and speaking with an Engineer from the machine’s manufacturing company, it was established that the hydraulic circuit of the lifting boom did NOT contain a check or non-return valve. Therefore, if pressure was lost, the boom could fall to the ground under its own weight (the machine was over 10 years old at the time of the accident). It emerged that the standard practice was, non-return valves are fitted to machines automatically if they are designed for use in the construction industry; however they are not fitted as standard, to machines which are supplied for materials handling as used in the waste industry. How to prevent a similar accident occurring with the existing material handlers used in the organisation? How to ensure that future machines, either purchased or leased, did not cause similar accidents? The company carried out a survey to understand how many material handling machines did not have the non-return valves fitted, especially if they were used for maintenance activities. 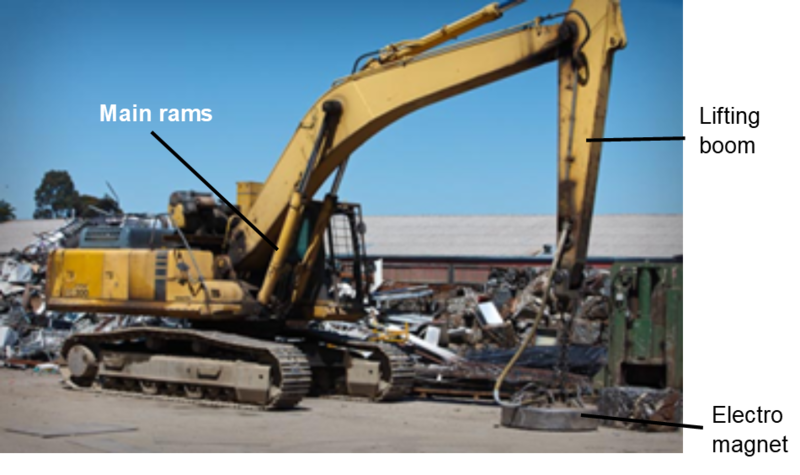 Over two months, all machines identified without non-return valves fitted were then retrofitted with appropriate check or non-return valves in their lifting boom hydraulic circuits. In order to ensure that machines brought into the company in the future did not present a similar problem, it required a change in company policy. On discussion with senior management, a decision was made and a procurement standard implemented which specified that all new machines, whether purchased or leased, were to have the non-return valves fitted in the hydraulic circuits before being used on any sites within the organisation. 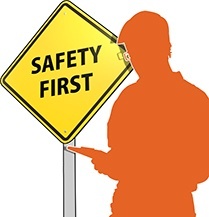 One essential element of accident prevention is to learn from past events and use this information to implement changes, with the objective of preventing similar circumstances recurring in the future. These changes must not be solely focused on the direct causes of the event i.e. unsafe actions or conditions; but also on the root causes i.e. lack of management systems and controls. Organisations need robust policies and procedures; company leaders need to encourage everybody to overcome common barriers such as fear, blame and report accidents and incidents. A more positive safety culture can then be embraced by all staff that aims for accident prevention but also learning from failures. The “learning organisation” can then reap health and safety performance rewards.